One of the hardest parts of planning a trip to Thailand isn’t finding the flight or hotel, it’s actually deciding where to visit in the country. We know that every area of the country has something different to offer, and it gets a little bit more difficult to decide where to go with so many options on the table. For a lot of people, Bangkok is seen as the place to be if you want the experience of the busy city life, with an endless list of clubs, bars, and restaurants, especially once the night comes around. However, for people looking for even a small taste of the beaches elsewhere, or the lush tropical regions, the city might leave one wanting just a little bit more. It’s a good thing then, that for those choosing to stay in the city, there’s a hidden spot that’s just perfect for a quick date, or a unique chill session that’s just a short trip outside of downtown Bangkok, that’s not a spa or resort. Enter the “Green Lung” of Bangkok, Bang Krachao. Located in Phra Pradaeng, 45 minutes south of Bangkok by train and a short car ride. Some might be surprised to learn that Bang Krachao was not always what it is today, as the island was man-made, created through the use of a canal running across a single side. But who cares about that? if it looks like a mini tropical island and feels like one, who are we to say anything? The island is a literal breath of fresh air outside of the busy streets commanding the overall area of Bangkok. If you’re looking for quick adventures, you’ll find them in Bang Krachao. Strangely enough, one of the most interesting portions of the park is that it gives you the ability to watch the busy world just outside from the comfort of what sometimes feels like a real jungle. While you’ll catch some of the streetside noise on your journey, it’s easy to lose sight and sound of it as you travel through the area. There are some very convenient ways to get around. Bang Krachao is home to a full fleet of bicycles and bike paths, as well as bike tours. For about 100 THB, you can have your way with one of the two-wheelers, yours for the entire day of exploration. 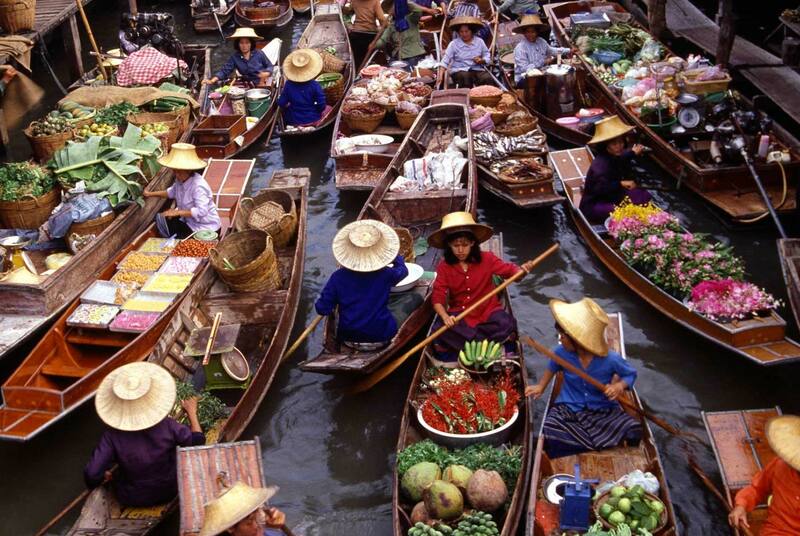 While this isn’t one of the regular floating markets you’ll come to experience in Thailand, with a bevy of floating boats, this is still a nice place to visit while on the island. If for the very least, you can grab something to eat along the way while traveling through the park. Keep in mind, this part of the island is only open on the weekends, so if you really want to see it, plan accordingly! Each room is said to be named after an insect, and different rooms have different details based around it. The butterfly room, for example, has butterfly designs laid into the walls of the room. Even if you’re not trying to stay within the limits of Bang Krachao, the treehouse allows visitors to stop in and dine at the location’s restaurant, Reflect Treehouse, making for a very unique and romantic experience, if you’d like to make it so. The treehouse simply glows at night, upping the ante if you’re looking for a really special, romantic night away from the city. It might be a mouthful to say this name for a non-Thai speaker, but this botanical garden is probably our highlight of the park, and it’s one that is a must-go if you’re looking to really envelope yourself in the charm of the island. The park is a super popular place for birdwatching, as well as simply bicycling around. All in all, Bang Krachao is a great day trip for Bangkok vacationers to step out of the city and into the shade, have a great date day trip, and just to get some peace and quiet. Let us know on Facebook how you spent your time on the island, or if you and your partner ended up sleeping over at Bangkok Tree House!